On Tuesday night, February 19th, 2013 the Spanish Section of the Modern Languages, Literatures and Cultures Department celebrated el Lanzamiento del Vol. 2 de El Tintero, the release of Vol. 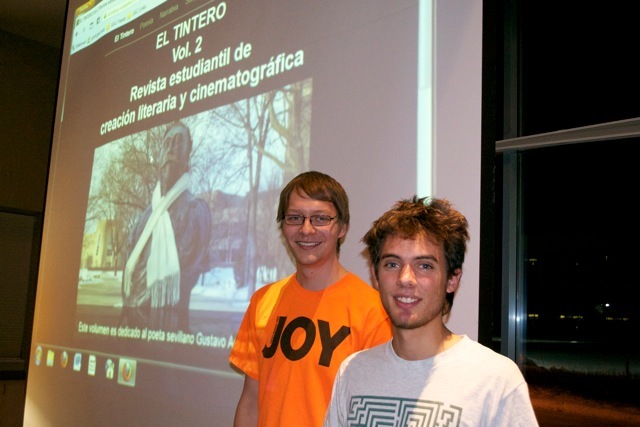 2 of El Tintero, the on-line Spanish Literary and Cinematic journal of Gustavus. The works were uploaded to El Tintero website to join Vol. 1’s already diverse line of works, including poems, short stories, short movies, and storyboards. The event kicked off with welcoming remarks from El Tintero editors Ian Shay (fall ’12) and Trevor Oestenstad (spring ’13). After these remarks Assistant Spanish Professor, Ana Adams, gave a brief presentation about Sevillian poet Gustavo Adolfo Bécquer, to whom the issue was dedicated. Adams, a Sevillian native herself and whose grandparents in fact lived on the same street as Bécquer, gave a presentation, briefing Bécquer’s life and his contribution to the Sevillian people and Hispanic literature as a whole. She read three of the Romantic poet´s works. The event then continued with the students themselves—every author/creator read their works in addition to telling a little bit about themselves, their majors, their inspirations, and how they came to write a piece of work in, most often than not, a second language. The event continued with the reading of a work by “Community Guest Writer” Violeta Adame, a promising 15-year old writer who lives in St. Peter´s sister city Petatlán, Mexico. The night ended with guests and writers gathering for punch, snacks and homemade tamales! A great way to foster love for language, literature, art, and Spanish; everyone involved is proud and considers the release party a success and hopes for it to continue as one. ¡Que viva El Tintero!